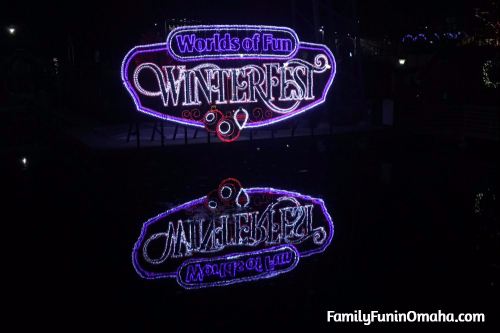 Amazing WinterFest Holiday Experience at Worlds of Fun! 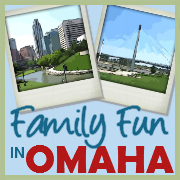 Special thanks to Worlds of Fun for partnering with us so that we can share all about the fun at WinterFest! 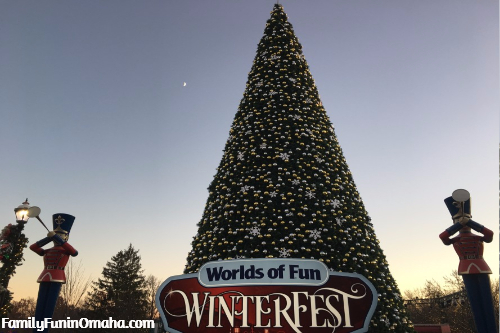 Enjoy a wonderful Holiday Experience at Worlds of Fun – WinterFest! 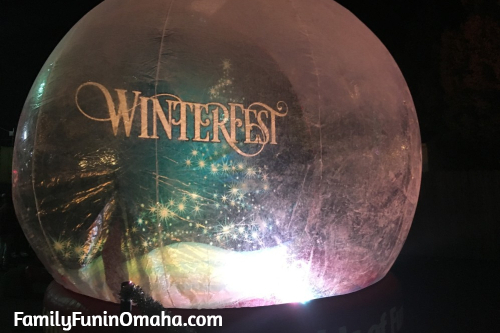 The minute you walk into WinterFest, you are immersed in the Holiday Spirit, surrounded by beautiful lights, a huge glistening Christmas tree, Holiday music, shows, songs, and even some snow! 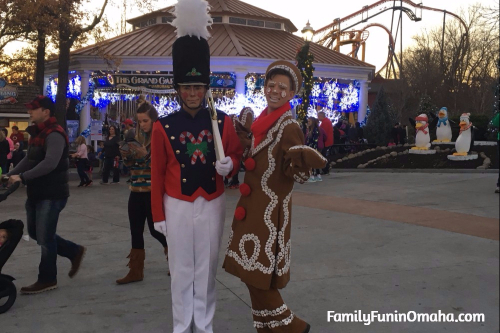 This special Holiday experience is filled with family fun, activities, shows, rides, characters, and special moments that will create lasting memories. 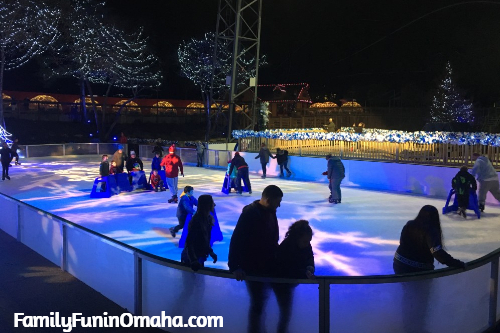 Find more fun in Kansas City over Christmas here! 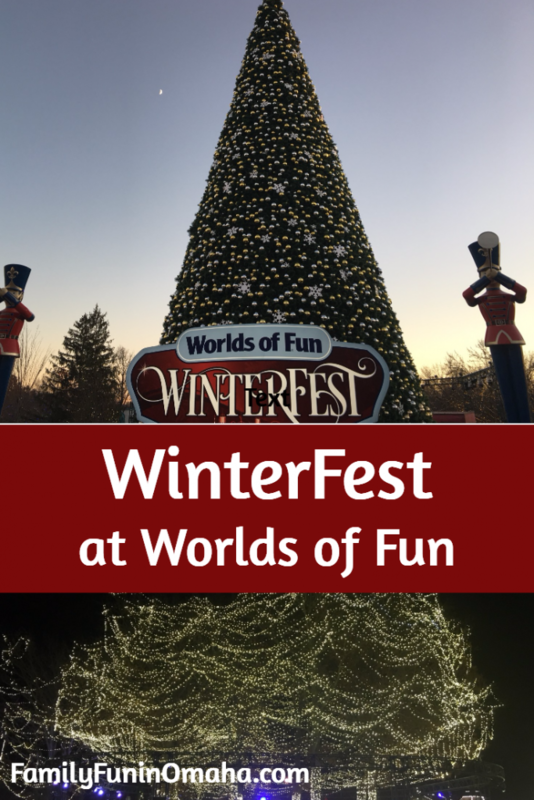 Experience all the fun at Winterfest at Worlds of Fun! 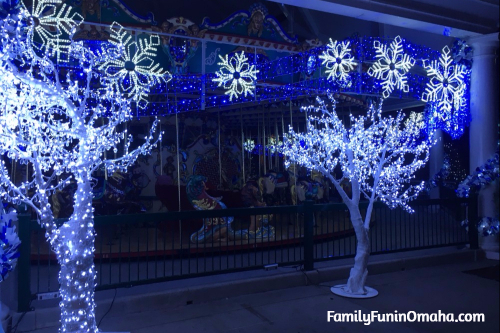 Immediately upon entering Worlds of Fun, you are greeted with dazzling lights and displays. 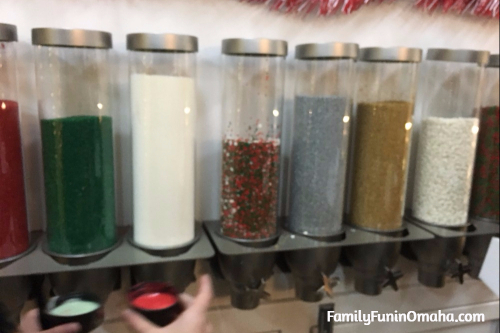 Families can take their photo with St. Nick and meet holiday characters like Jack Frost, the Sugar Plum Fairy, Candy Cane, Jingle Bell when they visit. 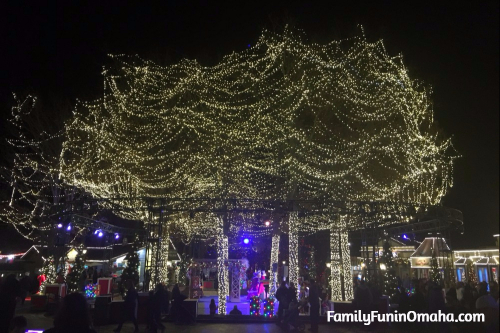 Everywhere you look, twinkling lights, intricate displays, and many of the rides all decked out in sparkling lights. The carousel is one of the first rides you see! 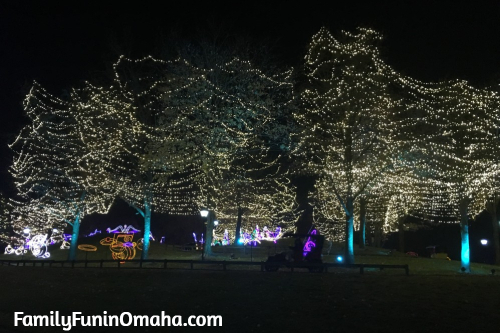 Beautiful Holiday Lights surround the park! 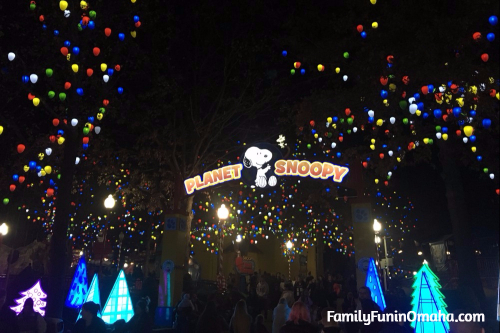 Planet Snoopy is transformed into Charlie Brown Christmas Town filled with giant colored light bulbs throughout the park. 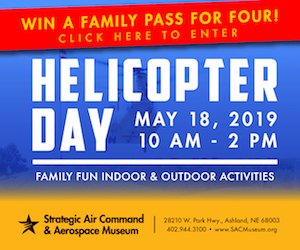 Many of the rides are open including Woodstock Gliders, Lucy’s Tugboat, and Peanuts 500! 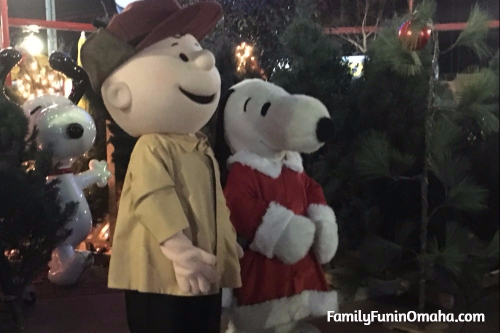 Meet Charlie Brown and Snoopy at Charlie Brown’s Christmas Tree Lot! 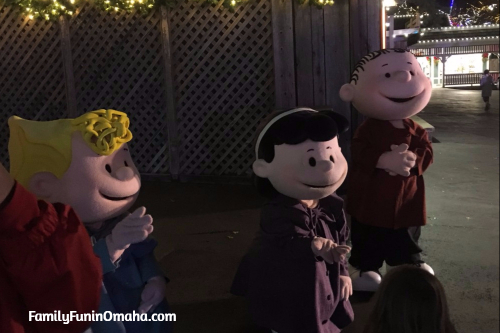 Meet the other Peanuts Gang, too! 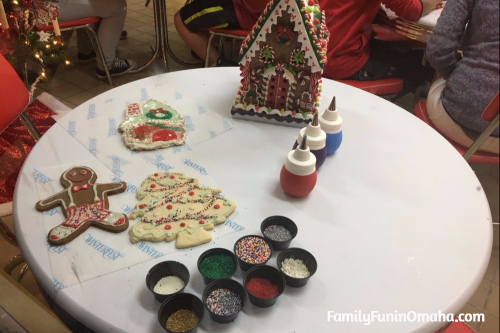 Choose from frostings of a variety of colors, sprinkles, and toppings to decorate your cookie how you would like. 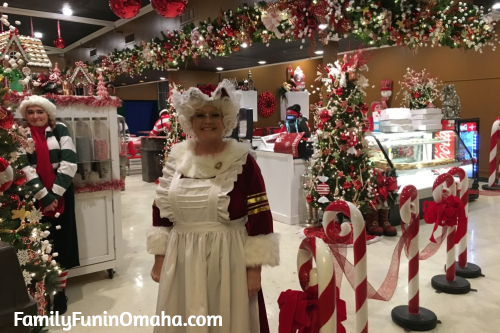 Mrs. Claus joins in the fun! 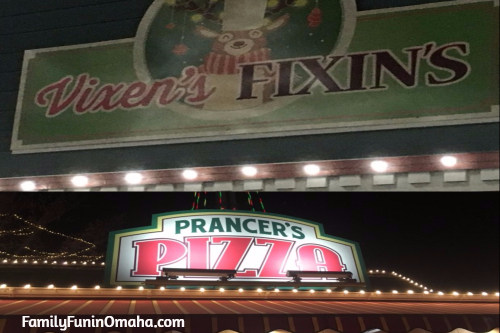 Many restaurants are open, with fun new names! 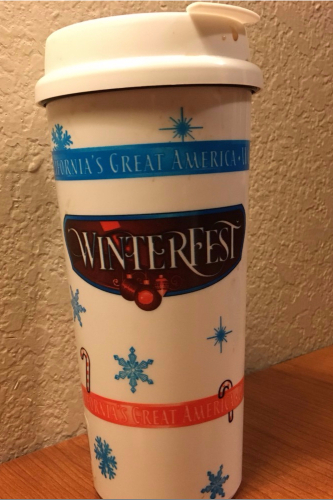 You can purchase a special WinterFest cup and refill it with delicious Hot Chocolate! 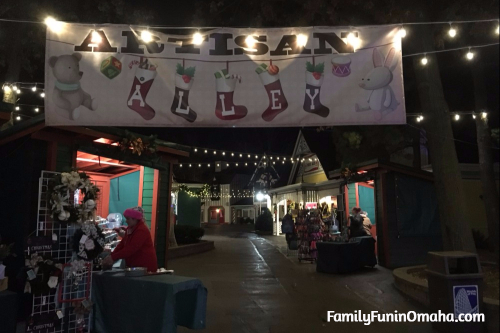 Browse through many Holiday shops, including the Artisan Alley, a local showcase of 30+ local artists offering hand-made collectibles and special gifts for your holiday shopping list. 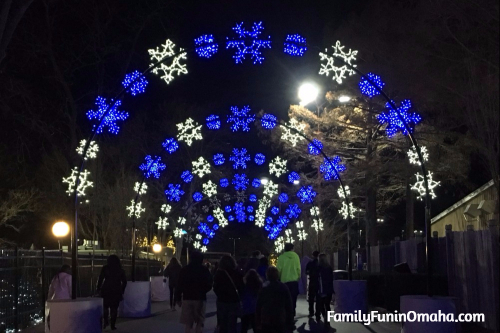 We loved our favorites the Prowler Roller Coaster (especially fun at night where you can see all of the bright lights!) and the Autobahn Bumper Cars! 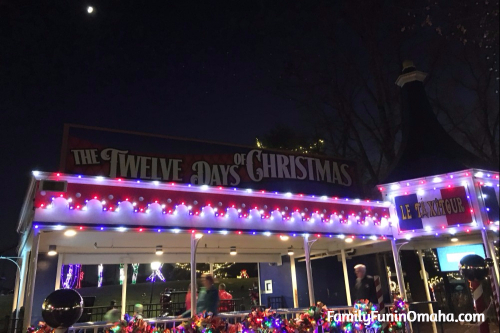 Le TaxiTour is transformed into the 12 Days of Christmas! 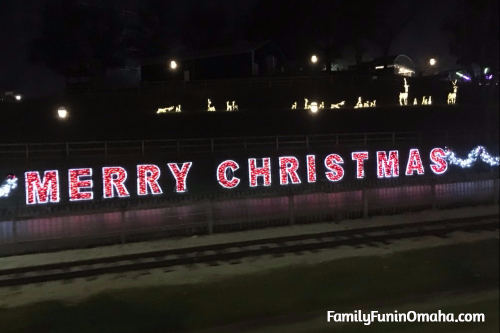 The Worlds of Fun Railroad is transformed into the WinterFest Express! 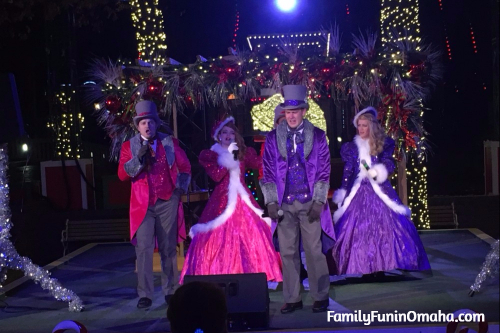 Enjoy multiple shows throughout WinterFest, including the Christmas Tree Lighting Ceremony with snow, Charlie Brown’s Christmas Spectacular, and more Live Entertainment! 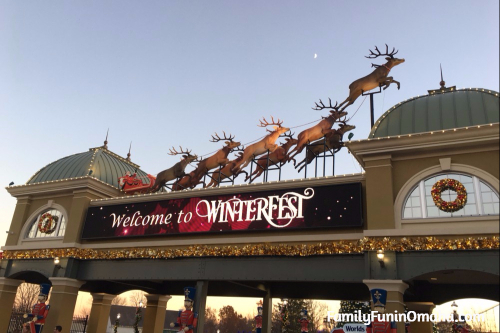 One of our favorite rides at WinterFest – Woodstock Gliders! Walk into a giant snow globe! 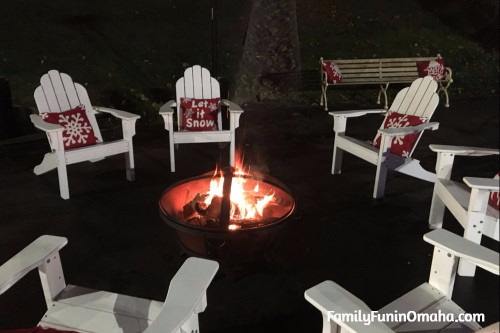 Warm bonfires invite you to warm up on the colder nights. Truly amazing spectacle everywhere you look! 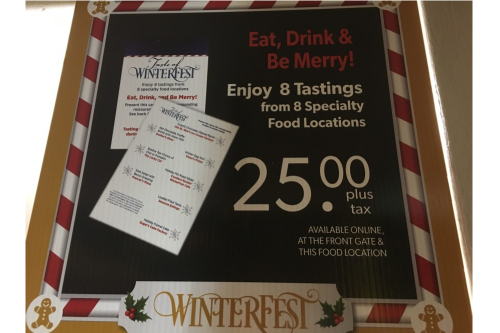 Experience A Taste of WinterFest, which includes 8 Tastings from 8 Specialty Locations! 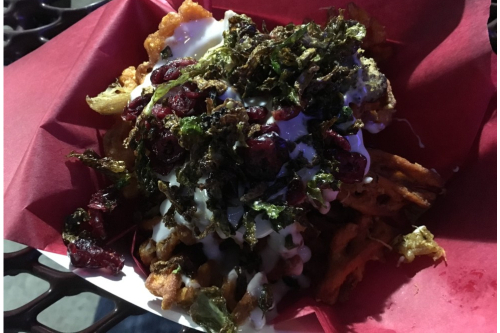 Our favorite item was the Holiday Loaded Yams, delicious sweet potato fries, topped with chicken, cranberries, toasted shaved brussel sprouts, and a cheese sauce. 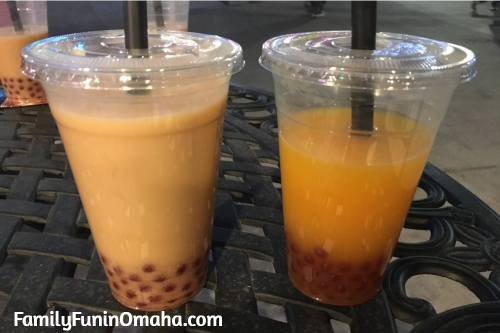 Choose from 2 kinds of Bubble Tea, Chai or Pumpkin Spice. 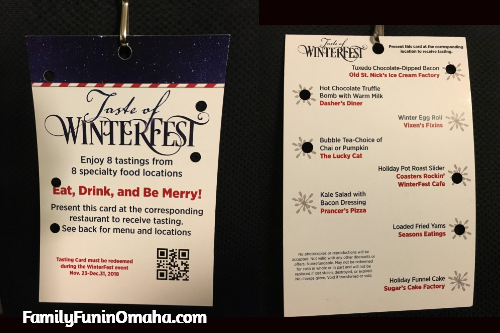 We were definitely full by the end of the night and enjoyed a variety of tastings! 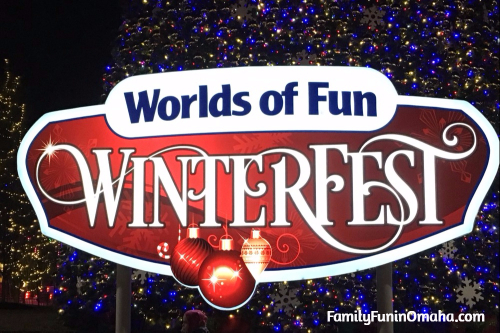 WinterFest at Worlds of Fun is a wonderful way to celebrate the Holidays with your family! 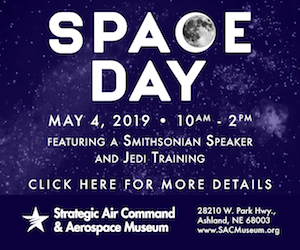 Find out more about Tickets here! 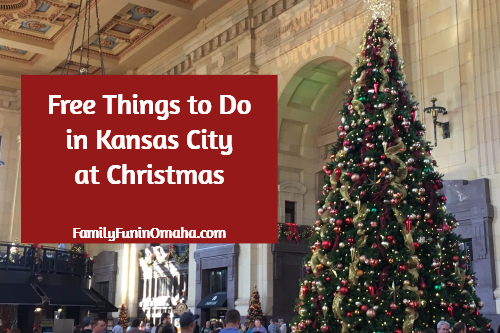 Find more fun things to do in Kansas City at Christmas here!